Grammy Award-winning musician/producer Nile Rodgers and Tad Kubler of The Hold Steady are the latest music and pop culture experts to join the first-ever CBS News Live Experiences event, "50 Years: The Beatles." CBS News is marking the 50th anniversary of the Beatles' first American television appearance with a live media event, set to take place Sunday, Feb. 9, from 6:30-8:00 p.m. ET at the Ed Sullivan Theater in New York, 50 years to the day from when the Fab Four first performed on CBS' "The Ed Sullivan Show." Anthony Mason, CBS News senior business correspondent and anchor of "CBS This Morning: Saturday," will host and moderate the event, which will be live streamed on CBSNews.com and CBSNewYork.com/50YearsLater. Featuring several high-profile musicians and artists whose work has been influenced by the Beatles -- ranging from singer-songwriter John Oates to George Harrison's first wife, Pattie Boyd -- the one-time, live symposium will examine the social and musical impact the Fab Four had on the world. It will also highlight rare footage from CBS News' extensive archives of the Beatles' first three days in New York City and their famous appearance on "The Ed Sullivan Show" on Feb. 9, 1964. Both websites will feature photo galleries, archival radio interviews with the Beatles and written pieces looking at the band's songs and cultural influence. Panelists set to appear include Nile Rodgers, a guitarist, producer and composer, multi-Grammy Award winner and the co-founder of the hit-making disco and R&B group Chic. He is considered one of the most influential producers of his time and has produced hits for a who's who list of music stars, including Madonna, Diana Ross, David Bowie, Mick Jagger and Michael Jackson. Most recently, Rodgers earned three Grammys for his work with the electronic group, Daft Punk. Tad Kubler is the lead guitarist and co-writer of the Brooklyn-based alternative rock band The Hold Steady. The group has been influenced by the work of The Beatles and has gained critical praise for its real and raw songwriting that has drawn comparisons to Bruce Springsteen. Also featured will be John Oates of the hit-making duo of Hall & Oates, and "Monty Python" collaborator Neil Innes, who co-created and performed all of the songs for the Beatles spoof, "The Rutles." Panelists also include Pattie Boyd, a photographer and model who was married to George Harrison and the inspiration for his song "Something"; Andrew Loog Oldham, who managed the Rolling Stones from 1963 to 1967 and before that was the publicity assistant to the Beatles' manager; guitarist, songwriter and record producer Mick Jones, who founded the rock band Foreigner and played the same Paris concert hall as the Beatles 50 years ago; and director Julie Taymor, whose Oscar-nominated film "Across the Universe" is a '60s-era love story powered by more than 30 Beatles songs. The event, presented by "Motown: The Musical," will also include an art gallery and exhibit of Beatles memorabilia displayed inside the Ed Sullivan Theater. Guests inside the theater that night will also watch a presentation of "The Night That Changed America: A Grammy Salute to the Beatles," which will air on CBS that night at 8 p.m. ET. The two-hour special will feature current top artists covering the songs performed by the Beatles on that historic night and through the years, as well as footage from that landmark Sunday evening and other archival material. "History was made 50 years ago in the Ed Sullivan Theater -- our reporting will help audiences reconnect to that history," said CBS News President David Rhodes said in Tuesday's announcement. The event, dubbed "CBS News, 50 Years Later...The Beatles at The Ed Sullivan Theater: Presented by Motown The Musical," is the first in an anticipated series of CBS News Live Experiences, a "conversational tour and video series" that will examine culture, society and politics of today in the context of catalytic events that took place 50 years ago. 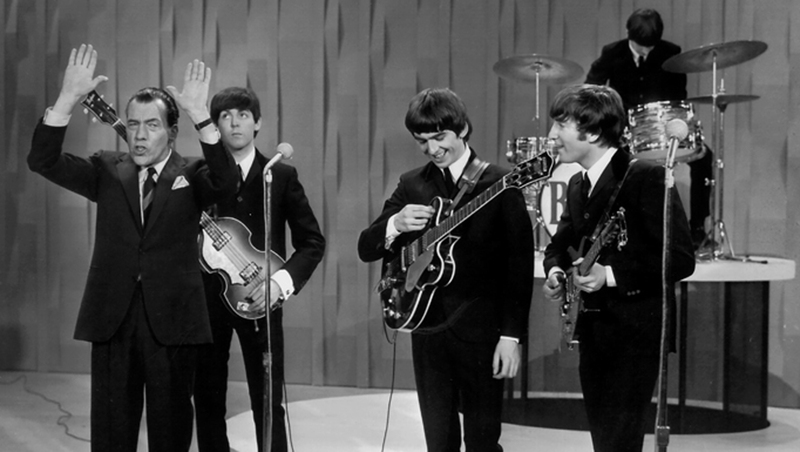 "The Beatles' appearance on 'The Ed Sullivan Show' -- viewed by 73 million people in 1964 -- was the single most significant moment in pop music history ever, making the Ed Sullivan Theater -- exactly 50 years later -- hallowed ground on Sunday, Feb. 9," said David Goodman, president, CBS Live Experiences. "No other news or media entity has as close an affiliation with this pivotal moment as CBS, making this the perfect event to launch CBS News Live Experiences -- a series of live multimedia events that will take notable archival CBS News stories and bring them to life with audiences nationwide. CBS owns some of the most recognizable and valuable content in the world. We look forward to exploring ways to extend these brands to build stronger ties with our fans."